The Lower Merion Water Company, which purchased the site of Martin’s Dam and a few acres surrounding it in 1890, from James Martin, son of Richard Martin, for whom the Dam was named, started to build a large red brick pumping station and also raised the original dam breast. Whether the company ever intended to operate the pumping station is an open question. At any rate no machinery was ever installed in it, and it seems quite possible that the building of this pumping station was only a gesture on the part of the promoters to reassure stockholders of their good faith. On the face of the matter, it seems difficult to believe that the flow of water from the dam was ever sufficient to supply the needs of the lower Main Line. In the meantime, farmers in the valley below the dam obtained a court injunction, halting the use of water for the purposes designated by the newly formed water company. Stocks and bonds had been sold far and wide, many even in England. Legend has it that the bonds were lost in transit by the sinking of a boat between this country and their ultimate destination. The old Guaranty Title and Trust Company of Philadelphia was trustee for the bonds, with the firm of Morgan, Lewis and Bockius as attorneys. In the end the promoters of this nebulous water company fled to Mexico and stockholders lost all the money they had put in the venture. It was not until the spring of 1936 that the legal entanglements of the situation were sufficiently cleared up to assure clear title to Martin’s Dam Club for its purchase of the property. In the meantime George R. Park, a long time resident, who purchased the old Martin homestead for his family in 1906, saw the possibilities of the Dam as a swimming club. Several years before, a Mr. Kirby, from Radnor, had obtained a lease from Morgan, Lewis and Bockius, which Mr. Park now took over. Mr. Kirby had made some attempts at improvement of the property, one of them being the original platform on the site of the present diving platform. This was built on a foundation of solid masonry, placed in that location by the Water Company for some unknown purpose. Mr. Park, who had a large family of his own to enjoy a good swimming place just across the road from their spacious home, soon established an informal club at this location. Many came here to enjoy swimming in the cool spring-fed waters of the Dam, some on the basis of annual membership, others by admission at the gate. What remained of the one-time brick pump house was used as a bathhouse. 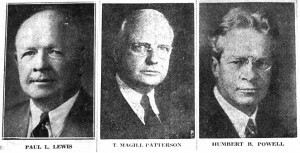 According to Paul L. Lewis, of Strafford, now president of Martin’s Dam Club, the idea of the Club originated in his mind and that of T. Magill Patterson as “they sat together on a log over at the Dam one day.” Because their children and their neighbors’ children were experiencing the joys of a “good old swimming hole” these two men could envision the benefits to be derived from an organized Club for the residents of Radnor township and its general vicinity. 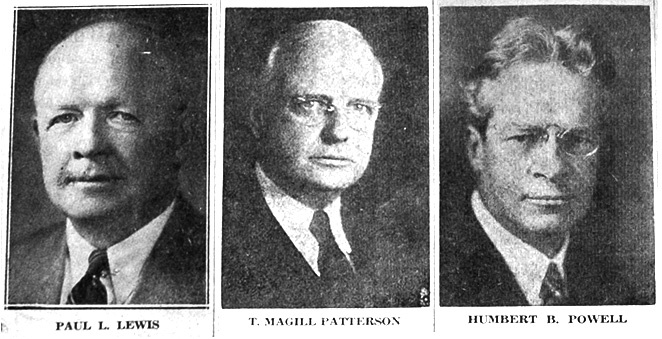 Mr. Powell was elected president, Mr. Lewis, secretary, and Mr. Patterson, treasurer. Mr. Powell held his office continuously from that spring of 1924 until his death in the summer of 1951, devoting much time to all the legal business of the club, particularly on the occasion of the eventual purchase of the property in 1936. Mr. Lewis has succeeded Mr. Powell as president, while still retaining his original office as secretary of the Club, and he has proved invaluable over the years. Mr. Patterson relinquished his post of treasurer to his son-in-law, John B. Yerkes, of Bryn Mawr, in 1945 after more than 25 years of continuous service. Minutes of a meeting held in October, 1931 record the fact that “Mr. Patterson has devoted a great deal of time since the organization of the Club not only to his official duties as treasurer, but also has given more time and energy to the management of all the affairs of the Club than any other one member of the Club. During the past seven years, he has visited the club property almost daily during the swimming season, and has been mainly responsible for the satisfactory manner in which the club has operated and for the repairs and improvements which have been made. In addition, he has received innumerable telephone calls and letters in regard to membership in the Club.” Despite ill health, Mr. Patterson’s interest in the operation he helped to found still remains unabated. To these five men, who came together 28 years ago this spring, the community owes the existence of a swimming club now numbering 625 memberships, the majority of which are for families. In addition, there is a waiting list, now of necessity confined to those living in the immediate vicinity. A quaint landmark on the well travelled road that leads to Chester Valley by way of the Colonial Village Swimming Pool and Martin’s Dam Club is the small white stone house on old Upper Gulph road just at its intersection with Croton road. Standing as it does among modern houses and remodeled old houses, the small whitewashed stone structure catches the eye of every passing motorist. So little changed during the 140 years it has stood there, it is, indeed, a quiet reminder of a day long past. The four acres were a portion of a large tract of land belonging to Rudolph Huzzard, a blacksmith, that extended as far west as Old Eagle School road. At a somewhat later date, this entire acreage could have been bought by John Wilds’ son for $1500. The first Wilds to come to America was another James Wilds, the great – great – grandfather of the present James Wilds. When he left his native England, in 1772, he received a “certificate of good conduct” signed by the minister and “principal inhabitants” of the township of Crompton Parish, of Cresturick, County Palatine of Lancaster, showing that he left there “with unblemished character” and with the good wishes of his community. By trade he was a wool weaver, and probably worked in one of the old mills near King of Prussia after coming to America. A son and daughter of this first James Wilds bought the four acres of land on old Upper Gulph road. Supposedly, they built the house that still stands there soon after they purchased the land, although there is no written record of the fact. Here, John Wilds and his wife had a family of 15 children, though all did not live to maturity. The house then consisted of a basement kitchen, with two rooms above them on the second floor. It was not until the Wellses remodeled what appeared to be an old stone house that it was discovered that the original structure had probably been made of logs, at least in part. In their remodeling the Wellses added eight feet to the west end of the house. At one time a barn, which has since been torn down, stood to the south of the house. So small and quaint and reminiscent of the past is this neat, white house, that it is difficult to believe that any changes at all have been made since it was built in about 1812. It is now the property of Mrs. Kathryn L. Stimson. Across the road from the old Wilds’ homestead, in the northwest corner of Upper Gulph and Croton roads, is another old house now occupied by Mr. and Mrs. John H. Preston, Jr., who bought it from Mr. and Mrs. Arthur P. G. McGinnes. The latter is a descendant of the Hughes family, who at one time owned almost all of the houses on either side of Croton road, from Upper Gulph road to Martin’s Dam, in addition to the famous old Hughes’ lumber and grist mills. In reminiscing of her former home, Mrs. McGinnes tells of the original deep well, now part of the porch at the northwest corner of the house. In the course of remodeling it was discovered that this house, too, was, at least partly, made of logs. A house dating back to the middle eighties is one on the left side of Croton road, past the Preston house. Now the property of Mr. and Mrs. Howard H. Stringer, it was originally built for Mr. and Mrs. William H. Owens. The former was a son of Sarah Hughes Owens. Sold to the Stringers by Mrs. John W. Henry, daughter of Mrs. Phoebe Hughes Brown, the original old white house has seen but few changes in its almost 70 years of existence, and none of them are of recent date. In addition to what has been written in three previous issues of this column, this is in brief the story of historic Croton road, along which ran the rapidly flowing streams that turned the wheels of some of the famous mills on the edge of Chester Valley, none more famous than the old Hughes Mill described in last week’s column. Some time in the late 1700’s or early 1800’s a grist mill had been built near Zook’s Dam, later to be known as Martin’s Dam, then converted into one for the manufacture of woolen materials, and was sold to Richard Martin in 1841. English born, the Martins had lived in Kensington before coming to Upper Merion township in Montgomery County to run a woolen mill such as they had owned in Kensington. They occupied a small pre – Revolutionary house across Croton road from the Dam. As the family grew, so did the house, until two wings had been added to it. All the Martin children, as they grew up, attended the small frame school on the right hand side of Croton road past Martin’s Dam, the walls of which are still standing. In winter they often went on stilts to keep out of the snow and in spring to keep out of the mud. Of the nine children born to the Richard Martins, James was the last to occupy the old homestead. Some of the original acreage he sold to the Thomas Nurseries. In 1890 he sold the rights to Martin’s Dam and a few acres surrounding it to the Lower Merion Water Company. Whether the project was conceived in good faith has always been open to question. Certainly the flow of water was never great enough to warrant the piping of water to the lower Main Line, which was the announced purpose of the Company. So complicated was the title that it was not until 12 years after the organization of Martin’s Dam Club that the Directors were able to purchase the Dam. There were other interesting terms of sale in regard to the transfer in 1800 of the old Hughes Saw Mill besides those referred to in last week’s column, which had to do with the flow of water into Zook’s Dam, now known as Martin’s Dam. When William Carver and Abner Hughes bought the sawmill and acreage surrounding it from Isaac Bewley and his wife, Ann Bewley, for “the sum of 700 pounds current lawful money” they also had an agreement with Henry Zook in regard to the spring, which supplied much of the water for the sawmill and the dam. This is particularly interesting in view of the fact that the spring house, which the new purchasers were permitted to build, is still standing, and is now more than 150 years old. Mrs. DeWitt P. Pugh, who owns the original Abner Hughes homestead, has taken steps to preserve it as a landmark. As agreed, the spring house was built by William Carver and Abner Hughes. The spring, which bears the reputation of never having failed, is one of the chief sources of water supply for Martin’s Dam Swimming Club. For many years it supplied all the water used in the Abner Hughes house. When Dr. and Mrs. William Z. Hill built their present house on the hill, across Croton road from Martin’s Dam in 1927, their water also came from this spring. In 1816, Abner Hughes built his new mill and with it a new dam, which, with numerous changes, has now become the Colonial Village Swimming Pool, organized by J. Howard Mecke, in connection with his extensive building operation in Colonial Village. To quote the article written on the old Hughes Mill by Annie Brooke Simpson for a meeting of the Historical Society of Montgomery County, “In 1816, Abner Hughes built the new mill. The dam built by him is now the Colonial Village Swimming Pool … He had the race dug; and the race bank still stands, lined with yellow clay, which never leaked. This clay he had dug from the field above the present upper garage, opposite the mill site. The clay hole became a stump hole; as ground was cleared and stumps were removed they were put into the hole with stones and earth, and from time to time were set on fire in order to let the ground level up”. Even before the building of this mill, however, water power was in use at the older mill. Before water power was used, logs were sawed by hand. According to Mrs. Simpson’s account, “a rip saw was used by two men, one above and one below the log, which was placed across the mouth of a pit. The log was stripped of bark and scribed above and below, and then sawed by hand. This primitive method must have been used much earlier, because water power was in use in 1800 at the old mill, which stood at the time of the purchase”. Mrs. Simpson tells in interesting detail of the kinds of wood that were sawed for various purposes. Wild cherry, white oak, poplar and walnut were used, and from logs of other kinds of trees a variety of “stuff” was sawed. From 1800 on there are records of the sawing of planks, boards, pieces of scaantling [sic], lath, sled runners and sleigh runners. By 1855 William Hughes had built a grist mill adjoining the saw mill at the rear. A new waterwheel of the overshot type was installed since, in order to run two mills, more water power was now needed. Mr. Cresson, a millwright from Barren Hill, built this waterwheel, while a Manayunk millwright, William Hutton, built the new grist mill. The former charged $500 for his labor alone. This wheel was replaced in 1887 by a new waterwheel, the last one to be installed. According to Mrs. Simpson’s record, Joseph Brown, a nephew of William Hughes, was the first one to run the grist mill. He was later succeeded by Abram Supplee. To this old grist mill the neighboring farmers, many from the Chester Valley section, brought their grain to be ground. Graham flour and whole wheat flour were made here, while oats, corn, wheat and rye were ground. Later still, William Hudson leased this grist mill for a period of five years, during which time he manufactured spools, bobbins and croquet sets. Bobbins and spools were sold to Bullocks’ Mill, in Conshohocken, and to mills in Norristown. William Hughes’ son, William Jr., who was born in 1848, worked in the saw mill with his father when he became old enough to assist with hauling logs, sawing and delivering lumber. Of those days, Mrs. Simpson writes: “Splendid trees for miles around in the counties of Montgomery, Chester and Delaware were bought, hauled to the mill, sawed and cured by drying in the mill yard, piled carefully so that the air could circulate about each board. The sun, rain, snow and wind seasoned the lumber, which was then ready to be sold and delivered to the cabinet makers and undertakers. Walnut trees were in great demand, and lumber made from these was regularly purchased by Mowday, of Norristown, and by Kirk and Nyce, of Germantown. In 1922, this old saw mill, famous for so many years, was torn down, as was the grist mill which adjoined it, both having fallen into disuse. “Nothing remains today to suggest the old Hughes Mill”, Mrs. Simpson writes, “unless one pauses to observe the water flowing from the Swimming Pool, which still runs merrily along the race bank that Abner Hughes “lined with yellow clay that never leaked”. Beyond the former log yard one sees the spring house, above the “spring that never failed”. Across the road from the mill site stands the old house. With dignity and with a certain nobility, it faces the woods known as the “One Hundred Mile Woods.” Four generations have called it home, aand [sic] each one in turn has followed Abner Hughes to rest in the burying ground at Valley Friends Meeting. “The old house, sheltered by the hills, basks in the sunshine and looks out upon one of the loveliest of scenes, with the Swimming Pool and Martin’s Dam on either side and the wooded hill between”. In the course of writing this series of historic sketches, many quaint old records and documents have come into the temporary possession of your columnist. Of the documents, none has proved more interesting than an insurance policy of 1863, found in the old Martin family Bible, now the property of Mrs. Emily Siter Wellcome and her brother, George Siter, of West Wayne avenue. The policy was issued to their grandfather, Richard Martin, to cover the machinery in Croton Mill, where Mr. Martin manufactured woolen and cotton material. The mill, located near Martin’s Dam, had been sold in 1841 by James Patterson to Mr. Martin, a former mill owner of Kensington. The policy was issued by the Fame Insurance Company, an old Philadelphia firm now long out of business. The $60.00 premium covered insurance for one year on “machinery generally, shafting, belting, fixtures, tools, implements and utensils, all contained in the stone and frame mill occupied as a cotton and woolen mill, situated on Croton Creek, Upper Merion Township, Montgomery Co., Pa.” These were valued at $2,700, while “water wheel, drum, gearing and connections contained therein” were insured for $300. This old mill belonging to Richard Martin was located just across the dam abreast of Martin’s Dam after Croton road takes its turn to the right. At one time there was quite a fall of water at this spot to turn the mill wheel. A small stone house which backed onto Croton road, somewhat to the left of the large house now occupied by Oliver Pepper, stood close to the mill. Like the Pepper house, it was owned at one time by the Richard Martin family. Both the mill and the small stone house have been destroyed. 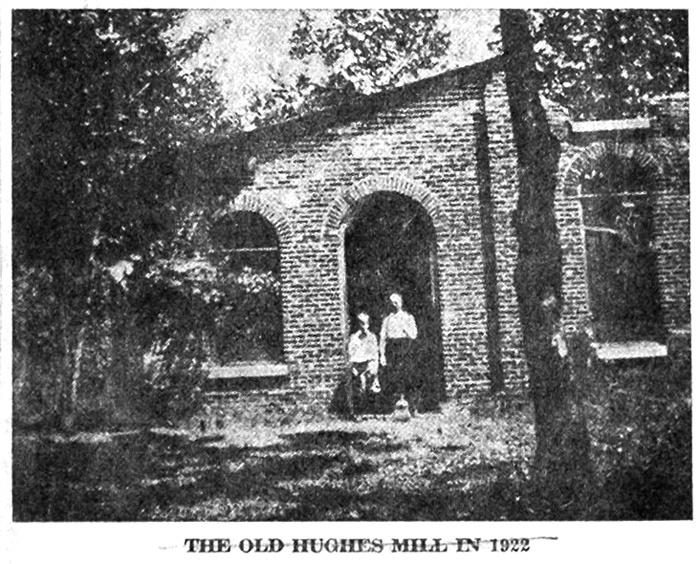 Another landmark in the Martin’s Dam section was the old Hughes saw mill, owned by William Carver and Abner Hughes, the latter a Welshman who founded the large family of Hughes which later settled all along Croton road. Abner Hughes’ house, built in 1820, is now occupied by Mrs. DeWitt P. Pugh. Other Hughes homes include the large residence at the corner of Upper Gulph and Croton roads, occupied by the William F. Machold family; the house on Croton and Knox roads, owned by Robert A. Apple, and the home next to it, now occupied by A. McKnight Sykes. Another Hughes house was the one beyond Martin’s Dam, on the left hand side of Croton road, in which A. Lincoln Castle lived for many years. The lovely, old stone house, now owned by Mrs. Pugh, was the second home of Abner Hughes, the first being a log cabin located on the rear of the same lot. The second home has its rafters pegged together, floors made of heavy oak timber and hand carved mantles. There are fireplaces in nearly every room, with a bake oven in the big fireplace of the former kitchen. It was in this house that Abner Hughes died in March 1844, leaving the mill and all its appurtenances, as well as the family homestead, to his only son, William. To each of his three daughters, who were all married, he left a house and grounds on Croton road, formerly called Reeseville road, which leads from Reeseville–now Berwyn–to the Schuylkill at Old Swedes Church. Several years before his father’s death, William Hughes had married Hannah Maris, of Chester County. They had five children, two sons and three daughters. William, Jr., born in 1848 and Frank born in 1857, attended Treemount Seminary. The former worked later in the sawmill with his father, hauling logs, sawing, and delivering lumber. Frank Hughes learned his trade as a miller at the Arcoln mills, and for many years afterwards operated the grist mill, which, by now was operated in conjunction with the old saw mill. When his father died in 1899, Frank inherited the house and the land, including the mill and the nearby quarry. In 1929, he sold about 40 acres of his holdings to J. Howard Mecke, who was responsible for the development of Colonial Village. He also sold the dam, by the old saw mill, which is now Colonial Village swimming pool. On March 9, 1938, Frank Hughes died in his 83rd year, in the old home built on Croton road 119 years before by Abner Hughes, founder of the family. In 1927, Mrs. William Z. Hill, a niece of Frank Hughes, and her husband, Dr. Hill, bought from Mr. Hughes an acre of ground on the hilltop across the road from Martin’s Dam. Later they purchased another two acres from Mr. Mecke. Here they have built a home overlooking not only the vast Chester Valley, but the hills beyond – the famous “Forty Mile View.” From their beautifully landscaped hilltop with its many flower gardens, Dr. and Mrs. Hill also look out over Martin’s Dam and Colonial Village swimming pool. Although the old saw mill was long known as the Hughes Mill, it antedated the Carver and Hughes ownership by some years. Indeed, at one time the primitive method of sawing wood by hand was probably used here. Water power was used, however, by 1800, the date of the Carver and Hughes purchase. This Henry Zook dam is now Martin’s Dam, named after the Richard Martin family, and the property of the Martin’s Dam Club. The Club was formed in 1924 by a small group of public spirited men in the Wayne area for the benefit of their children and their friends, and is now enjoyed by a second generation of children, as well as their parents.